The City Council of San Antonio, Texas have signed off on a real estate with Google which will make it easier for the company to build important infrastructure if the city is selected as one of the next markets for high-speed internet service. 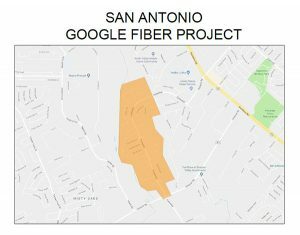 San Antonio is one of the cities currently being considered by Google as the next base of operations for Fiber, the 1 gigabit internet service. After signing the contract, members of the city council urged Google to officially select San Antonio for their service and pushed for more details about when the potential network could be made available to residents. The contract signed between the city and the tech giant would allow Google to deploy around 40 “fiber huts” to house internet infrastructure. The 12-by-26 foot structures would be instrumental in regulating and maintaining Fiber’s internet speeds, which clock in at around 100 times faster than typical broadband. Although Google has stressed that they have made no concrete decisions over which of their selection of 34 cities would receive the service first, San Antonio seems to have a good chance of being on the fast track.